So on wednesday I decided to treat myself to "Afternoon Tea" , the cookbook Frankie has bought back due to popular demand with "40-old school recipies your nana used to make". 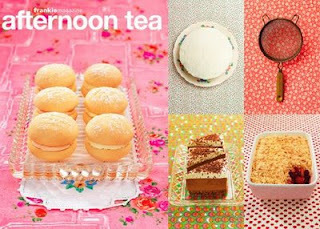 Put in your order and host a tea party full of treats and delicacies. Good to see this afternoon tea party. I really liked these desserts. Planning to have an afternoon tea party at one of venue New York. Will surely have lovely desserts for it. Want to arrange some creative cookies too that will look best there.